And I think all in all, it went pretty well. 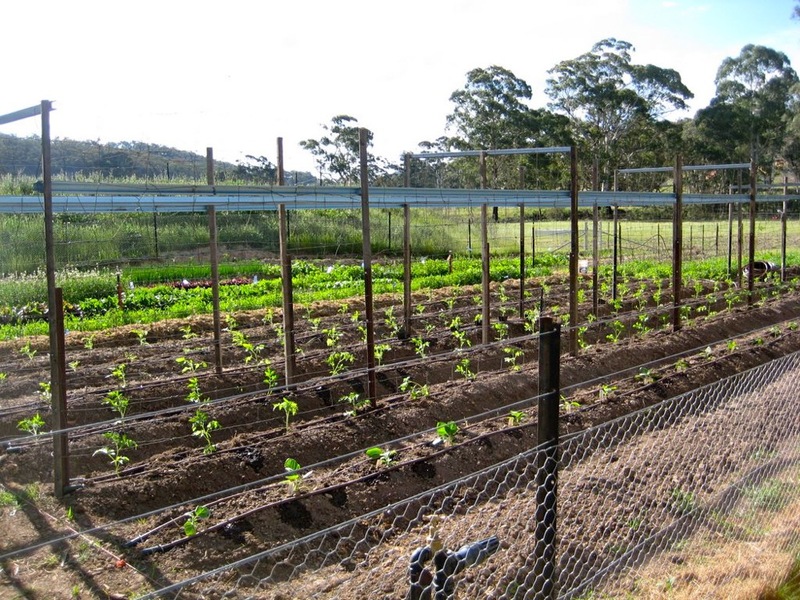 Ever since the gazillions of tomato plants (in numerous heritage varieties) were planted in the Milkwood Market Garden, we’ve been waiting for this great day. The inaugural squishing of the harvest. This was admittedly a test run of the passata machine… we’re about a week off from coming into full-blown tomato harvest, which should continue for a month or so. We expect this machine to get quite a workout over the coming months, between making passata by the truckload, juicing tonnes of apples from the little orchard down the road we’ve made friends with, and, of course, mincing meat in the interests of sausage. Mmmm sausage. 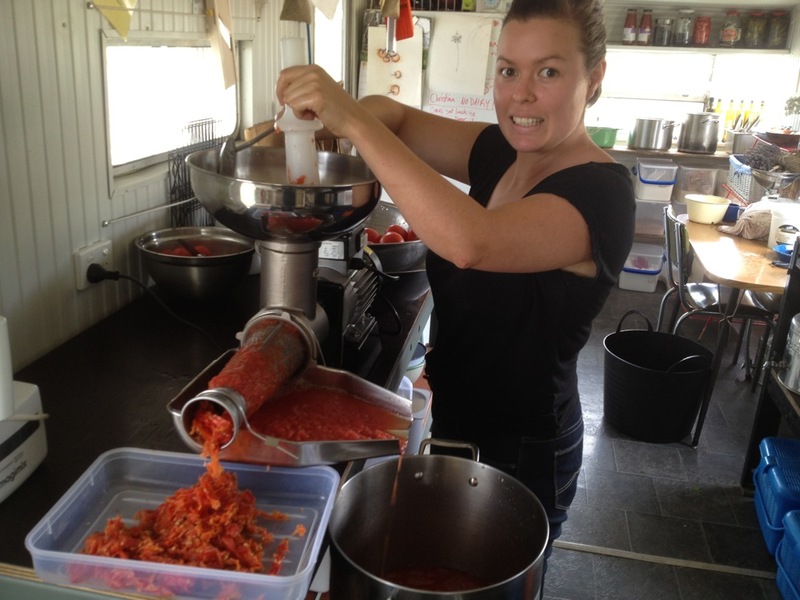 The passata machine was a labor of love in terms of research to choose which model to buy – we asked around, we rung up tomato growers, we canvassed all the passata-making Nonnas we knew. We weighed up hand-cranked versus mechanised. Cheap versus expensive. 1/3 horsepower motors vs 1 horse power motors. Single use vs multifunctional. And all this went on for months. In the end, we settled on a machine that could do three of the many things we need done during harvest: make large quantities of passata, juice a great deal of fruit (mostly apples) and mince meat. All these tasks need to be done on a large-ish scale here at Milkwood Farm, so we needed something with a lot of grunt. The machine we ended up with is a 1 horsepower Fabio Leonardi MR9, with both tomato crusher and mincer attachments. It is one serious machine. It’s also much bigger than I expected (not sure why i though it would be small, but i did). And it works a treat. My plan with this machine was basically ‘get it right the first time’ and get something that can be used by us and whoever else we know in our area that needs to mince or squish something, for decades into the future. I have been told of people that have been using these machines for 30 years, and they’re still going strong. 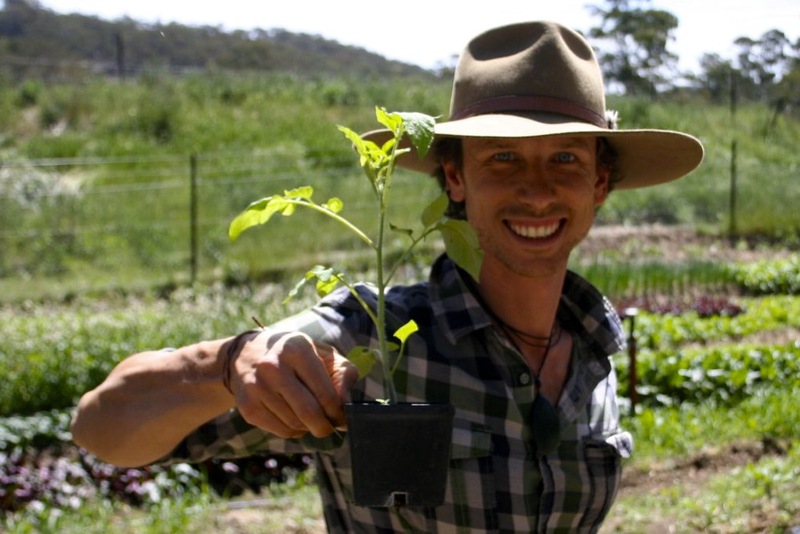 And I know it will pay for itself within a year or two in terms of allowing us to process a huge quantity of organic produce to then be preserved and eaten year round. Anyway. We’ll let you know how it goes. But we’re pretty happy with it so far! 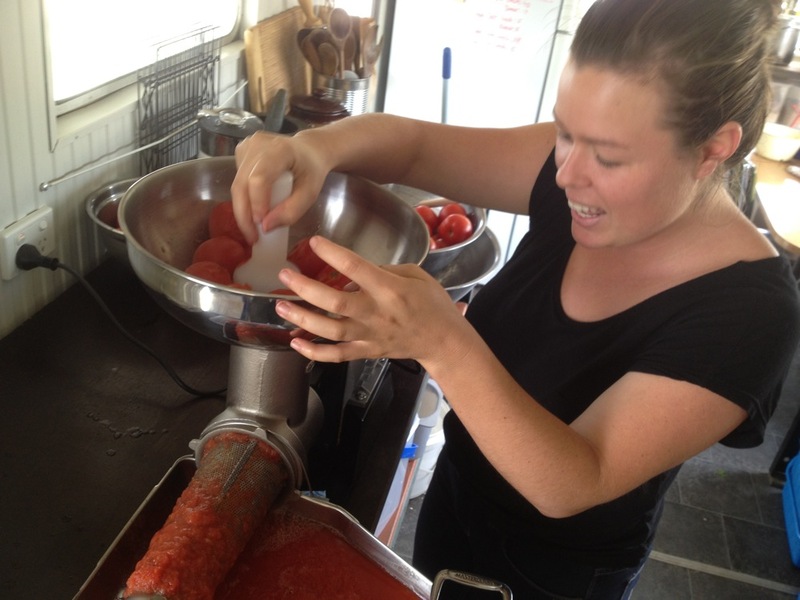 We got the passata machine online from Bake and Brew (based in Adelaide), who stock lots of the Leonardi stuff. They also sell 1/2 hp and 1/4 hp models, and they were great to deal with and knew all the answers to my questions. Yay for them. 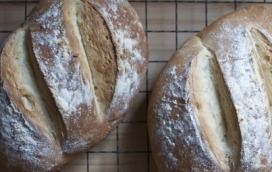 We had the best fun at the free little Fermentation workshop at t . .
It’s pretty hard to beat the smell of freshly baked bread at da . . 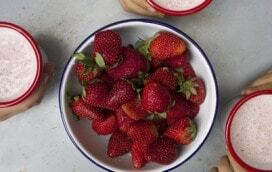 It's coming up to berry season, folks! 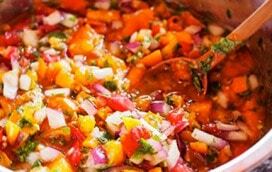 There is nothing quite as . .
We bought a Squeezo, can’t wait to use it again this year, but right now all my ripe tomatoes are going into Lacto-Fermented Salsa! YUM – and that squeezo looks amazing… well done. Wow tomato seed, is it one variety or lucky dip heritage seed? 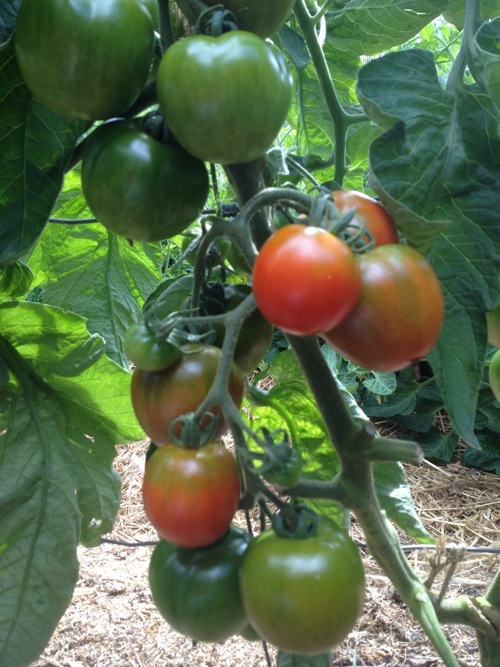 Excellent and thanks for the tips…..i just collected a couple of kilos of over ripe heirloom tomatoes from the foodconnect warehouse and are making my own passata to preserve too…. I would love to see more of the passata making process. *Do you just wash the tomatoes and put them straight in the machine? *What happens after the the tomatoes have been through the machine, are they cooked before bottling? Wonderful, can’t wait to see what delicious eats and drinks you make with it! Good on you! I canned mine, pressure canned! Still edible after four years! (if done properly, including a dash of acorbic acid) Fed a whole church one Sunday! Even gave to the hungry, they returned ever bottle, smooth bottle-lip intact and clean! I propose you try sauerkraut – I made it in food grade pails discarded from local stores, restaurants – pierced the plastic lids, inserted wine-bubblers! put plastic food grade screens (drilled holes in spare lids) with clean stones on top of cabbage to keep it immersed – they bubble away for a long time, no skimming needed! feeds many hungry people with good food fast ! Goes well with pork of all sorts, even hot dogs. gives the people needed nutrients! Cheap too! Food bank distributes the tubs into smaller containers, offer a trial taste, stuff went like wild fire! pickles too! Same story! Do down dills, you’ll see! 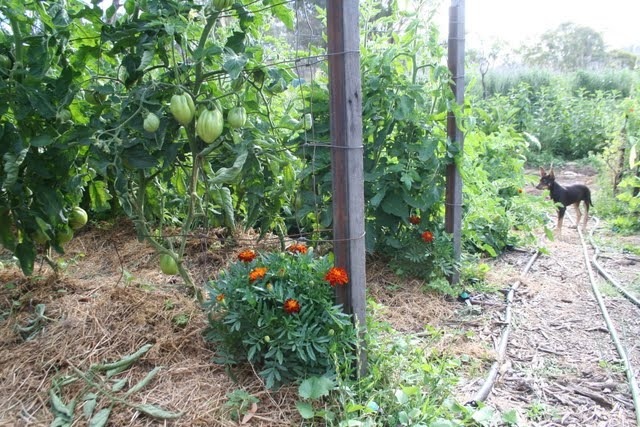 Don’t forget to compost the rejected tomato skins – ferments into very rich compost very fast. Great crop of tomatoes and it looks like a machine that will be very useful. What area of tomatoes do you have there ? It is also so good to see people being honest about what they promote (your note at the end Kirsten). It is a real plus that you have actually made a comment that you do not have a conflict of interest. Sincerity and a high standard of ethics is a wonderful thing to behold. This is in striking contrast to another site of which I am aware, where conflict of interest or otherwise is never declared and readers are often encouraged to purchase things/services that are not necessarily going to be in their best interests. I also enjoy your site very much. Thank you. It’s great to use and it can process a lot in a short time. A mate of mine got it for $15 at a garage sale, so it’s paid for itself many times over and will continue to do so for many years yet. Then pass through the machine, running the skins through a couple of times to extract as much pulp, juice and colour from them as possible. then allow the pulp to stand in a muslin lined colander (a big one) to allow the thin, clearish juice to strain through and then bottle the pulp at whatever stage of ‘thickness’ you want. Straining like that lessens the need for thickening/reducing by boiling. Bottle into beer bottles with a 1/2-1 tspn of both salt and sugar and a basil leaf. then sterilize in the bottles. or into Fowlers Vacola jars and sterilize. 1 1/2 litre wide mouth, screw top fruit juice jars work well to if you have them. Bottle the clear juice to be used as a base for vege stock, soups etc. (natural glutamate source is a good flavour enhancer) , then sterilize. Some juice can be added back to the Passata before bottling if it is too thick. The thick passata can be spread thinly on a smooth clean surface to be dried in the sun to make tomato paste , but that requires a bit more attention to detail. I’ve just done 20kg of tomato sauce (for pies and sausage rolls etc.) this weekend. 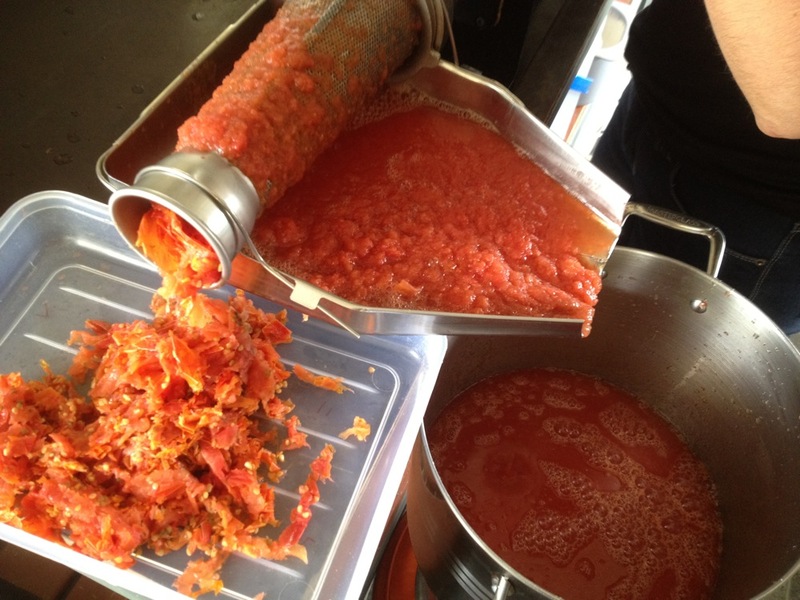 I’ll be doing about 200kg for passata hopefully next week… last years was used up a bit early. The last jar was emptied about a month ago. What do you do to prevent fruit fly? they are the bane of my tomato-growing efforts. how’s the Fabio Leonardi holding up? I’m interested in buying the same machine. How heavy is the machine/motor itself, is it easy to carry. It’s holding up great. Not the lightest thing on earth, but totally worth it. It will see us out, I’m sure!